President Obama may not call the individual mandate a “tax”—but John Roberts does. The Supreme Court closed out its 2011–12 term today in dramatic fashion, upholding the Affordable Care Act by a sharply divided vote. 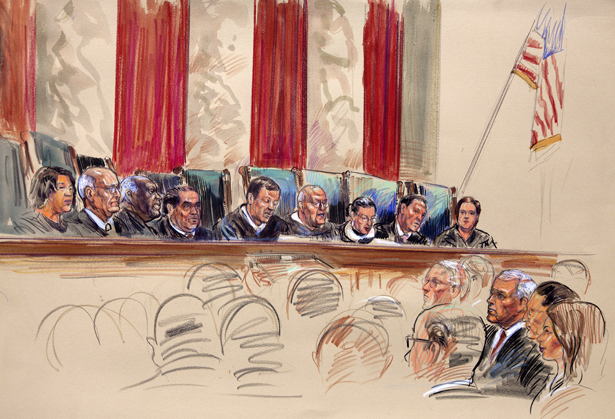 The Court’s bottom line, reasoning and lineup of justices all came as a shock to many. While I had earlier cautioned doomsayers that the law was “not dead yet” after an oral argument that others deemed disastrous for the law’s defenders, I don’t think anyone predicted that the law would be upheld without the support of Justice Anthony Kennedy, almost always the Court’s crucial swing vote. And while most of the legal debate focused on Congress’s power under the Commerce Clause, the Court ultimately upheld the law as an exercise of the taxing power—even though President Obama famously claimed that the law was not a tax. The most surprising thing of all, though, is that in the end, this ultraconservative Court decided the case, much as it did in many other cases this term, by siding with the liberals. Justice Kennedy, on whom virtually all hope for a decision upholding the law rested, voted with Antonin Scalia, Samuel Alito and Clarence Thomas. They would have invalidated all 900 pages of the law—even though the challengers had directly attacked only two of the law’s hundreds of provisions. But Chief Justice John Roberts sided with Justices Ruth Bader Ginsburg, Sonia Sotomayor, Stephen Breyer and Elena Kagan to uphold the law as a valid exercise of Congress’s power to tax. Chief Justice Roberts did go on to say (for himself, but not for the Court’s majority) that he thought the law was not justified by the Commerce Clause or the Necessary and Proper Clause, because rather than regulating existing economic activity it compelled people to enter into commerce. When one adds the dissenting justices, there were five votes on the Court for this restrictive view of the Commerce Clause. But that is not binding, because the law was upheld on other grounds. And while some have termed this a major restriction on Commerce Clause power, it is not clear that it will have significant impact going forward, as the individual mandate was the first and only time in over 200 years that Congress had in fact sought to compel people to engage in commerce. It’s just not a common way of regulating, so the fact that five justices think it’s an unconstitutional way of regulating is not likely to have much real-world significance. The other provision challenged conditioned state’s receipt of Medicaid funding on their implementation of the Act’s greatly expanded Medicaid coverage. Where Medicaid initially covered only several discrete categories of persons, under the ACA it extends to all adults earning less than 133 percent of the poverty level. The states argued that threatening them with loss of all their Medicaid funding was a coercive condition on the funding. Seven members of the Court agreed that if the law were enforced to take away state’s existing Medicaid funds it would be unconstitutional, but the majority upheld the provision as a condition only on the funds provided for the expanded Medicaid program. It seems unlikely that states will turn down those funds. Under the ACA, the federal government initially covers 100 percent of all new Medicaid costs, and while the federal contribution diminishes over time, it never falls below 90 percent of the program’s cost, so any rational state will likely take the money and expand its coverage. So why did Roberts do it? In part, the outcome reflects the fact that the truly radical position in this dispute was that of the challengers. Even very conservative lower court judges, including Jeffrey Sutton of the Sixth Circuit and Laurence Silberman of the DC Circuit, had concluded that the law was valid (although on Commerce Clause, not taxing power, grounds). But in addition, I cannot but think that at the back of Roberts’s mind was the Court’s institutional standing. Had the law been struck down on “party lines,” the Court’s reputation would be seriously undermined. In May, the Pew Research Center reported that favorable views of the Supreme Court as an institution had reached an all-time low. Sharply divided partisan decisions like Bush v. Gore and Citizens United appear to have done damage to the Court’s legitimacy—and ultimately, its legitimacy is the source of the Court’s power. Today’s result, which upholds the actions of the democratically elected branches on a major piece of social welfare legislation that affects us all against a challenge that was always a real long shot, driven more by politics than legal principle, may help repair the Court’s tarnished image. Indeed, it is worth noting, as the term draws to a close, that this conservative Court issued a surprising number of liberal decisions this term. It struck down mandatory life sentences without parole for juveniles; invalidated a penalty imposed on broadcasters for “indecent” speech; struck down a law making it a crime to lie about one’s wartime honors; extended the right to “effective assistance of counsel” to plea bargaining; invalidated most of Arizona’s anti-immigrant SB 1070; ruled that installing a GPS to monitor an automobile’s public movements requires a warrant; retroactively applied a liberalized crack cocaine sentencing regime to persons who had committed their crimes before the reforms were introduced; and held that the Sixth Amendment right to a jury trial requires the state to prove to a jury beyond a reasonable doubt all facts that increase a criminal fine. All in all, not a bad year for liberals before a conservative Supreme Court. But stay tuned, because next year it is likely to take up affirmative action, the Voting Rights Act and gay marriage. George Zornick on how the ruling makes it easier for Republicans to deny Medicaid coverage to millions.